Updated over every Tuesday night... . THE Bootle born actor Keith Chegwin was on home ground on 16 February 2009. The well know television presenter was in town to open the new Liverpool ONE Tesco Store and at 6:45am 'on the dot' he arrived in advance to unload his car. The star should be used to early mornings after being on ITV's 'GMTV Today' and 'Saturday Superstore' to name a just a few of the many early morning shows he has hosted. Not surprising when he arrived at the new store wide eyed and very lively. "I am ready to go... Where is my uniform?" he said to store staff, as he bounced out of his car with a massive smile. In one hand a PA system and the other a microphone. Keith is well known for his humour and being cheerful, but at that time in the morning, it took everyone by surprise. After he parked up, he was quickly briefed, told he would also be helping staff and handed a Tesco Store uniform. As the clock ticked to opening time Keith rallied the staff and also took a look around the store, lending a hand from time to time. Then 8am came and the public started to come in slowly; Keith quickly got things buzzing. Then came the official opening at 10am. With store manager Peter Green, Radio City and representatives from The Make A Wish Foundation, Keith proceeded to cut the ribbon. He also presented a £1,000 donation from the Tesco Charity Trust Fund to the Make A Wish Foundation. Then to keep things moving, Keith 'helped' staff by stacking shelves, 'helping' customers and working on the "Chegout". 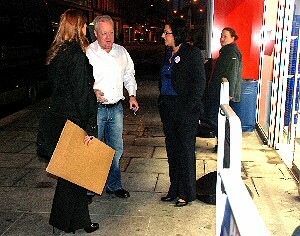 He also gave one lucky customer the chance to win £1000 in Tesco giftcards with his "Cheggers Checkout Challenge" game. Not forgetting to get many of the staff and customers dancing in the aisles. "Keith, you are a fantastic role model for all Liverpudlians and we hope you enjoyed the day as much as our customers and our staff did. Thanks for making the day so lively..!" said store manager Peter Green. Click here to see more of our photographs taken at the opening event. To see a larger version of the video click here. If you can't tell where the road begins and the pavement ends, how can you feel safe? 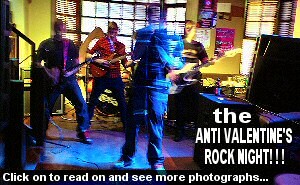 ANTI VALENTINE'S ROCK NIGHT! ! ! Copyright © PCBT Photography 2009. All rights reserved. All access to this site are governed by our Terms & Conditions. Southport Reporter is a Registered Trade Mark ® of Patrick Trollope. Layout Copyright © Patrick Trollope 2009.